Wearing a helmet for protection is a necessity when using today’s ski equipment and traveling at high speeds. The new highly engineered equipment is made with lightweight, strong materials and more sidecut to help initiate and carve smoother and faster turns. But the resulting speed in the turns increases torque on the upper body and creates the potential for imbalance and falls. The imaginative new helmet designs will not only save you from serious injury but also and let you enjoy your speed experience in style and rhythm. Each season, we research present the best new women’s ski helmet reviews from the top manufacturers. The helmets for 2015 are jam-packed with new tech features such as adjust-ability down to the contours of each head and venting to regulate body temperature. Cushy soft linings, comfortable straps and options to let you groove to your favorite music while taking laps all day are some of the latest helmet amenities. We’ve compiled a list of top picks and where to buy them online. Please contact us with any questions, comments or add your own ski helmet reviews. For safety certifications see each helmet review. The “ASTM” denotes it meets U.S. industry standards and “EN” it meets European standards. The specific Class A vs. B designation is related to head coverage and impact protection. Class B has to protect the top and rear of the head but doesn’t have to cover the ears and must be able to withstand an impact from a drop height equivalent to 375mm (37.5cm) . Class A has to protect the top and rear of the head and also the ears/side of the head and must be able to withstand an impact from a drop height equivalent to 750mm (75cm). As a follow up to this article, we will compile a list of Class A helmets, however, these are generally full “racing” style helmets that cover the ears and aren’t as popular with recreational skiers, for example the POC Skull Orbic Comp. SkiGenie Review: Smith’s classic Arrival helmet delivers its classic proven fit and function, all with a ladylike polish. This is an excellent option for the resort skier looking for lightweight comfort in a timeless style that can be worn season after season. With tech features like a customizable fit, thoughtfully placed adjustable air vents, audio compatibility and removable ear pads, you’re sure to have a smooth ride from bell to bell in this ski helmet. Description: Lightweight in-mold shell weighs only 14 ounces, so you aren’t going to feel top heavy when you’re schussing down the mountain. The Adjustable Dial Fit System gets the perfect fit with just the turn of a dial, and the fleece tricot lining keeps it cozy against your head. Overheating won’t be an issue thanks to the Airevac system that pushes air through the helmet and keeps your goggles clear. This was a great find! I have been searching for a well-constructed helmet with a great fit that fits my budget. The adjustable fit system lets me get just the right fit. I like the pearl finish too, just enough to make it less boring than plain white but not too flashy. I have tried on many helmets trying to find one I like that works with my goggles. This one is the most comfortable and has vents I like. The front brim is shaped well to go over many goggles and it has vents positioned over the goggle vents and I love the silky fleece ear covers. Find it on sale for $100 or less at Backcountry, Berg’s Ski & Snowboard Shop, Eastern Mtn Sports, REI, Skis.com & SummitOnline. Recommendation: With POC helmets at first the padding can seem a bit tight but once it packs out its perfect. This is a great helmet and with the addition of MIPS it is now arguably the safest helmet on the market. MIPS is a low friction layer between your head and the rest of the helmet. The idea is that the layer breaks away upon impact (especially a oblique impact — when your head hits an object at an angle). Additionally, it has all the bells and whistles such as goggle strap and adjustable head role; we highly recommend it. Find it on sale for $199 or less at Skis.com, Evo, Berg’s Ski & Snowboard Shop, U.S. Outdoor Store & SummitOnline. SkiGenie Review: Built with all the features you look for in a helmet, the Women’s Consort is a go-to choice for those of you rack up days on the hill. Tech features like the fully adjustable fit and magnetic closure are ideal, while the soft fleece liner adds extra comfort on those cold days. Great for the backcountry thanks to the superior adjustable venting in this helmet that allows you to let off steam before sending it back down. The color options, cool logo design and embroidered ear pads add an understated style to the rest of your ensemble. Description: The women’s Consort is a version that has been carefully refined to meet women’s specific needs. The extra-soft volume fleece inner lining offers extraordinary comfort and a significant warmth boost – yet its also removable and washable. RTS Fit System and the MarkAIR Channel System ensure an optimal fit and pleasant climate for the head. Super light with a double shell for extra protection from side impact, its magnetic strap closure gives a secure fit while cutting fiddle factor. The dial on the back adjusts the size and there’s a fluffy liner for extra warmth. Find it one sale for $110 or less at Backcountry, Skis.com & SummitOnline. SkiGenie Review: A super stylish option that will impress in the park and all across the mountain. Shiva’s style is complemented by tech features that create a fully customizable fit—removable audio-compatible ear pads and a comfortable padded chin-strap. This helmet adds a fashionable touch to the cool progressive skier looking to set herself apart from the crowd. Description: The light weight, half shell Shiva combines Twin Shell for less weight and more airflow, with EPS 4D to absorb more shock than traditional helmets. Salomon’s Custom Air technology provides a personalized fit while the Twin Shell ventilation system keeps your egg from ending up over-hard at the end of a steamy day. The Custom Air means that with a push of a button an air-filled cushion forms around your head for a perfect fit. Be sure not to over-pump or the custom feature could fail. Find it on sale for $120 or less at Backcountry & Evo. SkiGenie Review: The Aura has the look of a burly, big-mountain helmet and yet its pattern design and feminine touches from helmet to ear pads soften it around the edges. This helmet is fully tech’ed-out with Salomon’s custom air fit, ventilation, soft lining, removable, washable padding and audio compatibility. A great option for the dedicated skier that demands safety and style while getting after it. Description: Oval fit, Custom Air system and a magnetic buckle help make Aura the most comfortable women’s all-mountain helmet available. Salomon’s Active Ventilation system gives you three different options to keep your temperature regulated whether its a frigid mid-winter day or you’re making the last turns of the season in your bikini top. I get a great fit with the custom air feature. Find it on sale for $150 or less at Backcountry. SkiGenie Review: Unique to the K2 Virtue helmet is its efficient and thoughtfully placed ventilation. Its ample vents located where you’d place your goggles after a run, prevent goggle fogging. Its sleek, simple style with cute color pops on the logo and straps intend a subtle, womanlike look. This is another solid all-around, all-mountain helmet for the discerning skier looking for tech features with a unique, stylish flare. Description: Arriving at the corner of style and comfort with a perfect fit and great performance is the Virtue ski helmet, a favorite among females. It’s the answer to all-day performance in a lightweight design. Featuring Dual Active Matrix Venting for customized ventilation, 360 K2Dialed Fit System for the perfect fit, and Level 3 Baseline Audio System to keep you connected without having to take your gloves off. I’ve tried other brand’s helmets and none have fit me as well as the K2. No gaps anywhere, no sliding around, easy to dial in with or without ponytail, and fit my non-K2 brand goggles great. Love the color, materials, and venting system. No fog in my goggles ever with the goggle vent, and top vent is very efficient. I would like to see a better quality audio system with louder speakers. Easy to put on and take off, great construction, lightweight. It looks good, feels good, and is easy to adjust. Find it on sale from $96-160 or less at Backcountry, Evo, Skis.com, SummitOnline, Tahoe Mtn Sports, The House, & US Outdoor Store. SkiGenie Review: The Galena Helmet utilizes an advanced construction method for the ultimate in safety, and is well suited for big-mountain terrain or park and pipe. With all the tech features under the sun, this helmet is best for the high level skier looking to push her limits in a comfortable, easy to use, and safe ski helmet. Description: Delivering the best in customizable helmet fit, Anon has partnered with the industry leader BOA® technology to create a fit system that allows for easy, on-the-fly micro adjustments with just a turn of the dial. The BOA fit system smoothly distributes pressure for all-day comfort, without adding any bulk to your kit. It features a hybrid of in-mold and Endura Shell construction to combine serious protection with a lightweight feel and low-profile fit, and it has adjustable vents for comfort in any conditions. Find it on sale for $160 or less at Backcountry and Evo. SkiGenie Review: This helmet makes a great option for backcountry skiing adventures by featuring the most vents of any helmet out there and a low profile design that can fit in your backpack. It is super lightweight with an adjustable fit and magnetic closure for ease of use. The fleece and wool blend audio-compatible ear pads keep you warm, and most importantly, dry on those uphill jaunts. Description: The Facet provides completely adjustable ventilation for all conditions. Light weight and compact, the Facet features multi-shell, In-Mold Polycarbonate composite construction with ACT technology and the RCS fit system. My first reaction was “Dang, this is light!” Secondly, “Wow, this is comfortable.” The padding in the helmet is minimal, but just enough to be comfy. My new Pret is much lighter in weight than other helmets I’ve used. Its low profile shape fit’s my head perfectly, but did take a day or two to break it in. There is an adjustable dial in the back that helps snug the helmet to your head for added support and comfort. No matter which brand of goggle I use I get no “gaper gap”. It’s got a vent system that is easy to adjust with my gloves on. SkiGenie Review: Versatility is the name of the game with Bern’s Brighton helmet. It will keep you warm and comfortable as a hard hat but is not a true “helmet”. But if you are an all-around outdoor sport enthusiast then this could be a great value for a helmet that meets standards for year-round sports. Description: This model uses a thin ABS shell lined with EPS Foam to create a burly yet lightweight lid. This certified helmet is designed to crack and absorb a gnarly impact. Depending on the season your helmet will come with either an EPS Summer Comfort Liner or an EPS Winter Liner with options to buy the alternating season’s liner based on your needs. I like the helmet, though it fits on the snug side, it keeps me warm while skiing. It’s warm and comfortable. Excellent value for the price. Find it on sale for $100 or less at Backcountry & The House. Wearing a helmet while skiing is an absolute necessity. Gone are the days of rocking a flimsy beanie while sending lines or ripping groomers. Our desire to ski steeper and deeper terrain and charge down slopes packed full of skiers and riders results in our need to wear a protective helmet for our noggins. In this article, we’ve assembled a selection of new men’s helmets for the coming ski season that are sure to suit your needs for protection and safety while still looking good, providing warmth and even playing your favorite tunes. Please feel free to leave questions, comments and your own reviews below. SkiGenie Recommendation: Deemed one of the lightest helmets on the market, this helmet lets you forget it’s on your head as you rip around all day. When we care most about our new skis and fresh outerwear, we want a discreet helmet that can be a necessary part of the kit. The Pret Cynic will be there to complement your gear and keep you safe without stealing the show. Description: Deceptively simple, clean, and capable with a skate-inspired design. All conditions. All areas. Featuring a removable audio-ready sound curtain and ecoSmart recycled liner. I personally love this helmet for its lightness, comfortable fit and great venting. It’s also set apart from the rest in its clean, simple design, which makes me feel unique. Find it on sale for $100 or less at Backcountry, Evo, Skis.com, & SummitOnline. SkiGenie Recommendation: If you like wearing your goggles under your helmet then this is the one for you. Winner of the 2015 “Editor’s Pick” in Freeskier Magazine, this helmet is specifically designed for the park skier, integrating park style with safety. In addition to the comfortable fit, it includes a magnetic snap buckle, that makes it easy to take on and off. Description: The Anon Talan helmet is integrated with passive ventilation channels to draw in fresh air through the front vents and pull moisture out the back, cooling you down without chilling you out. A Boa fit system ensures optimal comfort, and Strap Stash, a recess in the customized EPS foam liner, allows you to comfortably sport your goggles under the helmet. I got this helmet mainly for the BOA system because I like a snug fit. The helmet is very large, not the actual fit, but the helmet itself is quite big, making it difficult to fit my hood over it. Find it on sale for $110 or less at Backcountry, Berg’s Ski & Snowboard Shop, Evo, Skis.com, SummitOnline, The House & US Outdoor Store. SkiGenie Recommendation: An excellent all-in-one helmet that’s stylish, safe, ventilated and audio compatible. This helmet is fit with a small visor that helps keep goggles in place and minimizes any gap between goggle and helmet. Constructed with ultra-lightweight material and adjustable open or closed ventilation, the Marker Ampire comes in classic black or white or in fun, colorful options. Description: Thanks to premium quality hybrid shell construction this helmet is light, comfortable and rugged. The RTS fit system means that it adjusts to your head’s shape in one simple step. Paired with new Marker goggles, the Ampire forms a superlative unit that reduces any goggle fogging. The ear pads are compatible with audio systems so that your tunes will be with you wherever you are. Comfortable, seems secure, seems to work based on a few impacts. Can add speaker system to earpads, which is a plus. The buckle is unique and really cool, it uses a magnetic system to make it easy to unlock with a single gloved hand. Find it on sale for $129 or less at Backcountry, Skis.com & SummitOnline. SkiGenie Recommendation: This helmet is built for the hard charging skier ready to push his or her limits. The customizable fit eliminates any movement between the head and helmet creating a snug, comfortable and safe interface. It even has ear pads for warm, spring days and a completely removable lining to wash out after epic adventures. Description: Top of the line big mountain helmet with Custom Air fit system and built in visor. Light, protective, ready for big descents in big conditions. The Salomon Prophet Air fits nicely all around and has performed well in the park and out of bounds. This helmet fits very comfortably, plus the solid build and the “air” inflation system are great. I also liked the addition of the mesh over the air vents, which prevents snow from coming into the helmet. Find it on sale from $160-175 or less at Backcountry, Skis.com, SummitOnline & US Outdoor Store. SkiGenie Recommendation: Versatility is the name of the game with the POC Receptor+. If you pursue multiple sports throughout the year then this is your one-helmet quiver. Built to be knocked around, this helmet is as safe as it gets and is suitable for taking hard falls on the slopes. Description: Receptor+ is developed for multi-disciplinary activities and is the only helmet in the world that has the appropriate safety certifications for skiing, snowboarding, biking, skateboarding and water sports. The helmet is equipped with the patented VDSAP system with double overlapping shells and has an Aramid Penetration Barrier and a multi-impact EPP liner. I’ve had it for two seasons now and love the way it fits and how durable it is. It’s taken some serious hits and still holds up. I have POC goggles, and it’s a seamless fit. Really impressed. I love this helmet, yet be aware of the fit. POC helmets fit a little smaller than giro and smith. Otherwise, it is a great helmet. Find it on sale from $150-$220 or less at Backcountry, Skis.com & SummitOnline. SkiGenie Recommendation: Another great all-around helmet option from Smith. The fit, comfortable padding, customizable ear pads and sleek design create a top contender in the 2015 helmet lineup. It comes in understated yet cool color options and has perhaps the most vents of any helmet out there to create a climate- controlled environment. Description: The Vantage was built for the hard-core, demanding the ultimate in everything. Using AEROCORE™ construction that features Koroyd® simultaneously maximizes full coverage protection and increased airflow. For the most custom fit, the Vantage offers the Boa® fit system. Combine all this with the Smith pioneered AirEvac technology for goggle integration, and the Vantage delivers the perfect blend of technology, venting and style. I’ve been really happy with the Smith Vantage. The BOA system makes it easy to adjust for just the right fit. The Vents are easy to open or close while skiing, and it keeps my head safe and warm. This is the best helmet I’ve ever owned. It vents super well, I haven’t had a single problem with fog. Smith stepped the game up over my old Variant helmet with a protective mesh on the vents and it’s quieter, with less wind noise. The BOA system is great and will give you a snug fit even on the strangest head shapes. Also the earpads are removable and have a zippered pocket so you can add speakers. Find it on sale from $143-$220 or less at Backcountry, Berg’s Ski & Snowboard Shop, Eastern Mountain Sports, Evo, REI, Skis.com & SummitOnline. SkiGenie Recommendation: POC has designed one of the safest helmets out there with the MIPS system, that both protects your head on initial impact and as you continue to tumble. Its streamlined design is a lightweight, no-frills answer for the dedicated skier out there pushing the limits either in the backcountry or in bounds. Description: The Fornix Backcountry MIPS is known for its award winning lightweight and aramid reinforced shell. The helmet is equipped with the patented MIPS system to reduce the rotational forces to the brain in case of an oblique impact. The Fornix is generously ventilated and the size adjustment system makes it possible to customize the fit of the helmet to make sure it stays safe and comfortable in place. I like the look, it’s reminiscent of helmets past like the round Boeri helmet. It doesn’t have a visor, which makes flipping your goggles up easier. The helmet is really comfortable. There are no pressure points, the harness doesn’t dig in anywhere, and it fits the shape of my head nicely. It has generously cut and soft ear pockets that are comfortable all day long. Find it on sale from $200-$219 at Backcountry, Berg’s Ski & Snowboard Shop, Evo, Skis.com, SummitOnline, Tahoe Mtn Sports & US Outdoor Store. For the price conscious try the Salomon Icon, for hucking big cliffs safely the POC Fornix MIPS, for a little style the Anon Wren and for our top all-around pick check out Smith Vantage. Recommendation: Rarely do we see so many positive and so few negative reviews for a helmet. The fact that it is compatible with other goggle brands is an added perk. What People Say: “This helmet is a big improvement on the older bowling-ball-esque helmets from yester-year. The big selling point for me is that the soft ear coverings are warm, protective, and yet not occlusive so that I may wear my bilateral behind-the-ear hearing aids without getting feedback.” And a long-haired ski diva says “It´s the only helmet that fits with my pony tail. Recommendation: This is a great all-arounder, it covers all bases, it is warm, light, looks good and is designed by one of the icons in the sport. Additionally, the reviews are overwhelmingly positive. Try it with your goggles. If it fits, wear it. Recommendation: We admit, the idea of being able to change the color of your helmet to coordinate with your mood and outfit seems a bit girly girl, but the Lazer folks are pros at helmet design and this product is a beast. Using duo mold technology it maximizes safety while also allowing users to adjust the size with ease. Its a great choice, albeit not as cheap as some of the others. Recommendation: Best for those who want a lightweight helmet with added protection. The hybrid design combines the lightness of an in-mold construction with the added protection of a bulkier shell. Recommendation: The special fleece liner is indeed friendly to long hair, but more important, its injection mold exterior provides added protection and durability. The purple color will help some of you 80’s rockers upgrade to some high tech gear. Quality helmet at a good value. Recommendation: We had higher hopes for this model but unfortunately it is does not live up to our standards. For the price conscious try the Smith Gage, for hucking big cliffs safely check out the Lazer Hoodie, for a little style check out the Shred Toupee and for our top all-around pick check out the Giro Edit. Recommendation: One of the lightest helmets built at 375g, is low profile and packed with features. Full x-static lining stays cleaner, secure goggle attachment and adjustable for the pitch angle of the helmet. All this with a special mount for your camera. It´s a keeper! Recommendation: This helmet hugs the head in certain spots to provide maximum safety and thick comfortable padding. Generally, it fits well but if you have an odd shaped head it can feel like it is pushing on pressure points. Order it and if you don’t like it you can always return it. If you are used to goggle clips this might not be for you. Recommendation: As Sean Petitt´s helmet of choice, this helmet already has a great rep. Its built for both comfort and speed which is a tough balance to find anywhere else. The helmet is sized true so no need to up or down size and the liner is plenty warm to use without a hat or skull cap. Some people complained about the audio system, but that should not be the main reason to buy a helmet. Recommendation: Try it on in person if you have the opportunity. If you are looking for a good value this certainly has all the features you will need but some say it looks big on people with smaller faces. What People Say: The Pros: Nice looking, excellent ventilation, fits well with Smith goggles, great price. The Cons: Many complaints about “disorganized design” and ear pads that keep falling out. A few sizing issues. Recommendation: According to the company “Shredvent: Uses A System Of Helmet Vents To Pull Warm And Moist Air Out Of The Goggles And Exhaust It Out Of The Helmet To Prevent Fogging, Shredwheel: Easy To Dial In A Custom Fit, Even With Gloves On, Shredry: Breathable, Temperature Controlling, Anti-odor And Anti-static Inner Lining So You Will Stay Dry, Comfortable And Warmer In Winter and cooler in summer.” This is a great helmet for those looking for something light and comfortable. What People Say: There are not a whole lot of reviews and that is because those skiers chasing down its designer Ted Ligety don’t have a whole lot of time to waste. I know the brand well, own one of their helmets and there is a reason Shred owners don’t chatter about helmets on the internet, they’re off skiing. So trust if you will and try it out. Recommendation: Sounds great, but aggressive skiers should realize that this is an in-mold construction. In-mold helmets are made by fusing the shell and shock-absorbing foam liner in a single molding process. They are sleeker and lighter than injection-molded helmets, but they provide less protection for those who subscribe to the school of hard knocks style of skiing. Recommendation: Lightweight and safe offers an ideal combo. We also love their Interact technology. The website says it best “We recognize that goggles and helmets have a symbiotic but not monogamous relationship. This is why each Lazer snow helmet is designed to work with multiple partners so you do not need to be married to only one goggle brand.” Only one caveat: Freeskier notes that the fit is not adjustable. Can’t find the perfect brain bucket here? Check out our 2013 – 2014 ski helmet reviews buyers guide here (men’s and women’s). Recommendation: POC is known for its innovative take on helmets. They definitely hit the mark with this one. A top of the line ski helmet and great fit for everyone, beginner to advanced. What People Say: Super lightweight, great venting and a perfect fit. All around an awesome buy! Only drawback is that the earpads aren’t great for earbuds. Description: The ultimate balance of supreme protection, lightweight construction, and adjustable ventilation. After the wild success of aramid bridge technology in its mountain bike helmets, POC integrated the same technology into the winter Fornix Helmet. Aramid bridge construction offers massive energy dispersion during impact while keeping the helmet shell lightweight and comfortable on your head. As a crowning touch, the Fornix helmet includes an adjustable venting system that pulls hot air and moisture away from your head with lightning speed and ultimate efficiency. Recommendation: This helmet supports a range of goggle brands, looks great and is an excellent choice for all types of shredders. No matter who you are, or how fast you are, you can’t go wrong with Smith. What people say: I’ve used a Smith helmet for the past four years! There is no comparison to the fit, and comfort. My goggles fit perfectly, no gaps. As an east coast skier, I really value the venting system that provides perfect temperature gauging in all conditions. Description: Smith is bringing helmet technology to the masses like no other. The Smith Transport utilizes Hybrid In-Mold technology to minimize mass and maximize ventilation without sacrificing one ounce of protection or style. The AirEvac 2 is the ultimate in goggle-helmet integration that connects shell vents and internal EPS channels to increase airflow and evacuate warm, moist air to prevent goggle fogging. Adjustable Boa Fit System allows you to effortlessly customize the fit of the helmet. Just turn the wheel to tighten or pull to loosen. X-Static performance lining fights the funk protecting you from the nasties. Recommendation: The hottest helmet to hit the park in years! Each year, this helmet gets better. EPS foam distributes force throughout the helmet so your brain doesn’t rattle inside your skull when things don’t go as planned, and the upgraded audio system lets you play your favorite song so you can tune everything else out and focus on stomping that 900. What People Say: Really comfy and stylish. I will be rockin’ the black on black color-wise. The liner is super comfy and I won’t be tearing it out. Instead I’ll just wear a neck warmer as it tends to get breezy back there. I wear a 7 1/8 and got the large and it fit right outta the box. From experience, I know this helmet can take ‘serious’ impacts. The vents also definitely help reduce the heat factor. Description: The Bern Baker EPS Helmet with Knit Liner was designed to make the helmet look, well, less like a helmet. A deep fit and super-thin ABS shell keeps it super low-profile so your head doesn’t look like a melon, and the subtle brim and wide range of colors gives it a unique look. The Baker also comes with a removable knit liner so when temps rise and it’s time to head to the skatepark, you can keep your dome safe. Recommendation: The K2 Phase Pro Audio Helmet is Sean Pettit’s choice helmet. That should say enough for you daredevils and wannabe risk-takers out there.At this price point, it’s top of the class. What People Say: I bought this helmet as a gift for my boyfriend and now need to get one for myself. My helmet was more expensive but not nearly as comfortable nor is the audio nearly as good. Description: The Phase Pro is a lightweight, low profile helmet. It has the Active Matrix Ventilation system that with the flip of switch you can cool down or warm up. The Phase Pro comes with the Level 2 Baseline Audio System that as integrated headphones and volume control that you can hook to your music device, so you can rock out on the lifts, and tune out the gapers. The K2 Dialed Fit System will get the Phase Pro to fit perfectly on your dome. Depending on your style you can snap off the goggle strap without any tools. The Phase Pro also comes with poly blend bandana so you can keep your identity concealed, or hopefully you are getting some sick face shots and you will keep the snow out of your mouth, if you forgot your snorkel. No wonder the Phase Pro is the helmet that K2 Pro Sean Pettit chooses to wear. Recommendation: Quality protection and a versatile helmet for all season, this park style helmet is perfect and very inexpensive so when you leave it on the table in the lodge you won’t lose your cool. What People Say: I lie somewhere between an intermediate to advanced skiier. It is great protective wear & stylish. My skull candy earbuds fit as well, which makes for a fabulous, ski day when alone. Best I’ve owned! Recommendation: A new look to combat the Bern legacy. The Boa is must have this season. It has everything you want—the plush interior, sleek look, and high quality audio, superior ventilation—at a lower price point. What People Say: Great fit, great feel, great look. I just got this helmet and am psyched to try it out this season! Very reasonable price for the quality. Description: If you want a lightweight helmet without sacrificing features or style, the Pro-Tec Riot Boa Helmet may be the one for which you have sought these many, many moons. The Riot features plenty of ventilation so you don’t burn up and a removable, washable liner to reduce the mid-season funk. The most braggable feature, however, is the BOA fit system, which ensures a snug, comfortable fit that you can adjust on the fly, even wearing gloves. What People Say: This is the most lightweight helmet I’ve owned. The result is that you will forget you are wearing it. I end up hiking a lot, regardless of what I am doing and where I am. This helmet breathes! And I feel incredible safe all over the mountain. Definitely recommend this! Description: Warning: putting on the Giro Montane Helmet will turn you into an airhead. We don’t mean that in a bad way—it’s just so lightweight, you might think there’s nothing there. But there’s plenty of tech packed into its 13.4 ounces, ready to protect you on your in-bounds exploits or backcountry ventures without weighing you down. Giro even included a handy carabiner clip so you can hook the Montane to your pack before heading out on the skin track. Can’t find the perfect ski helmet for you here? Check out the WOMEN’S 2012-2013 or 2013-2014 best of ski helmets reviews here. And MEN’S 2012-2013 and 2013-2014 here. What people say: Best fit with the lowest profile look and stellar adjustment capabilities. One customer notes that they were set on buying the Maze until they tried on the Seam and the extra cost is money well spent. Not the lightest helmet on the market but its warm. Description: The Giro Seam helmet features a new and improved Thermostat vent system, Giro’s new Stack Vent, and a feather light weight. What does all of this mean? It will keep your temp under control, your goggles clear, and your comfort level at an all time high. Finish it off with the best fit system ever made for a snow helmet and you are ready for a full day on the mountain. What people say: Great overall helmet, really light and good ventilation but not well insulated. Good visibility is a plus. Description: The Maze helmet is the new go-to. Clean, modern, minimalist-designed all molded into the worlds lightest certified snow helmet. With its modern and hip style, you will love this helmet. It is created with AirEvac 2 ventilation in order to keep airflow going. The end result of this feature is to reduce fogging and control temperatures. The in-mold construction of the Maze Helmet will keep your head warm and comfortable. The removable goggle lock on the Maze helmet is a nice touch allowing your goggles to stay secure for optimal comfort and performance. The Maze helmet is another in the long line of amazing Smith helmets. Description: This men’s ski helmet has an Air Evac 2 ventilation that helps reduce fogging and control temperatures. The Smith Maze helmet has in-mold construction that keeps the head warm and comfortable. This men’s ski helmet has a removable goggle lock on the helmet that helps the goggles stay secure. Description: It’s never too early to keep your kid safe when they hit the hill or pavement. Red’s lightest weight kids’ helmet, the Avid Grom, comes equipped with features that easily adjust to varying head shapes and weather conditions. Ready for year-round protection, the Avid Grom is armed with an ultra lightweight in-molded polycarbonate shell that is ASTM 2040, CPSC and CE 1077B certified. What people say: Excellent product at a great value, this Salomon helmet is both warm and allows for my pony tail to escape. Stays on the head well. 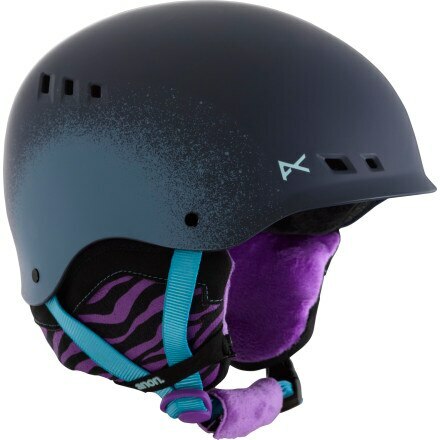 Description: The Salomon Venom Helmet bursts on the scene like a riot with features like Active ventilation, an Injected ABS shell that is ready to rumble, and even a women’s specific liner that allows space for long hair and pony tails. C’mon ladies, giddy up! What people say: The general consensus is very positive—customized fit with adjustment capabilties and its extremely war. The cons listed are weight and the visor when goggles are removed. Description: The award winning Variant Brim showcases Smiths helmet technology in its finest form. A full performance helmet veiled under a Hybrid Shell construction and finished with distinctive style. The Variant Brim ski helmet has several useful features. It is the perfect helmet for anyone looking for comfort, durability, and cool technology. The Variant Brim helmet is made with polycarbonate and ABS shells to ensure protection. What people say: Great fit for small heads. Good ventilation and earflaps allow for headphones. Description: After more than a decade of innovation and proven protection, the Giro Women’s Ember Helmet proves that performance doesn’t have to be synonymous with a techy look. The in-mold construction provides the durability you need and excellent ventilation while reducing overall weight. When the temps rise, remove the vent plugs, and stash them in your pocket for future powder and bulletproof days. Description: Helmets offer protection and durability. The G9 ski helmet for kids by Giro offers protection, durability and style. This sleek and clean helmet with fierce flames is created with In-Mold shell construction and an EPS mold. In-mold construction fuses a tough polycarbonate outer shell with the helmet’s impact-absorbing foam liner for extra durability without adding on any weight and with the usage of the EPS liner; your kids will get the most consistent performance across a wide range of conditions. Description: The Skull Comp 2.0 Race Ski Helmet is the ultimate race helmet – upgraded! The fact that it is 2.0 means that it is created with a new unique safety system. Who doesn’t want a great helmet that looks cool and offers on-point safety features? Because many ski racers hit gates pretty hard, risking the damage of the liner of the helmet, POC came up with the idea to shift the core material to multi impact EPP.